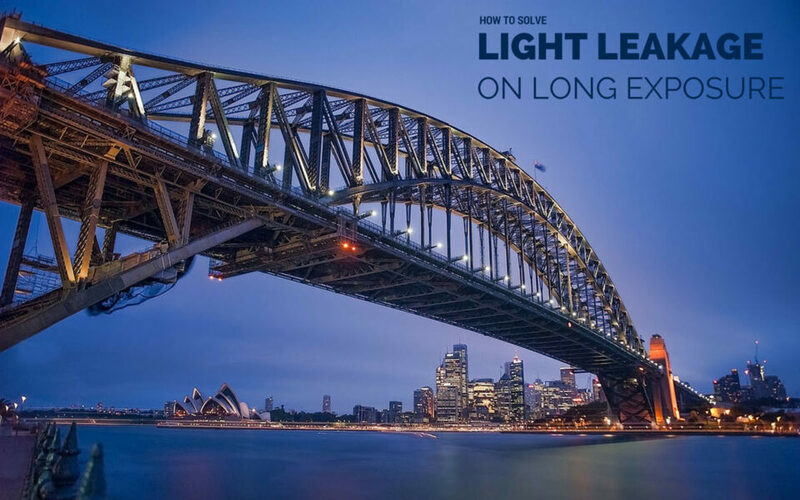 If you have experimented with long exposure photography, you may have seen light leakage issues in your images. For the uninitiated – your camera is a light tight body that is intended to allow light from one end only, and that’s the front of the lens. Light only enters when you press the shutter release. Normally, your camera wouldn’t allow light to enter through any other opening in the camera. However, unless you have a badly manufactured camera, there is typically only one source that could potentially harm your images, and that’s your camera’s viewfinder. Let’s talk about what you can do to mitigate light leaks during those long exposures. As I have pointed out, the chief culprit is the viewfinder. Being essentially a small optical path that receives light bounced off the prism and mirror inside the camera, it often does the reverse of its job too. Light enters through the viewfinder and bounces off the prism and mirror and then goes onto the sensor. Normally, you wouldn’t see this as a problem, but when you are taking long exposures, it can create major issues. This is not unique to digital cameras only, film camera have this issue too. However, compact cameras and those without an optical viewfinder do not suffer from this particular problem. Some photographers find it hard to identify the source of the problem. Many complain that it is their ND filter that caused weird light streaks in images. If you have been thinking the same, perhaps it is time to revisit this topic again – you might find your ND filter to be perfectly fine! The problem in that case most likely lies somewhere else, specifically in the viewfinder. Weird bands of color will appear in the image. They are also referred to as ‘light streaks’ because that’s what they look like – weird random bands of light. They could be horizontal as well as vertical. They are particularly exasperating for a landscape photographer, who may have had set his camera to shoot a slow shutter speed time-lapse and after several hours of shooting gets thousands of photos with light streaks on them. A truly annoying and frustrating experience! When you make long exposures, there is that much more time for even a small amount of light leak to create strong streaks in the image. 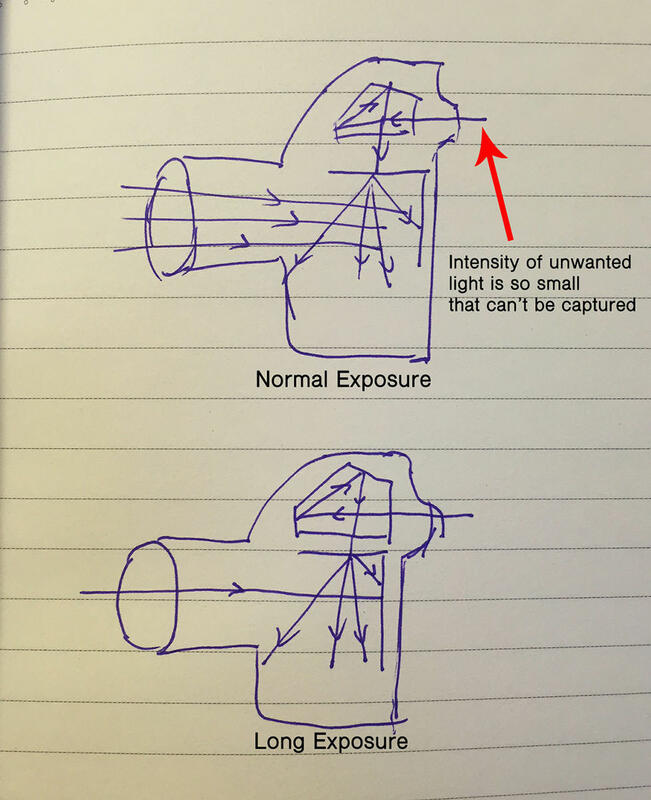 Normal exposures lasting for only a fraction of a second wouldn’t be enough for light leakage to really affect an image. Since photographers normally shoot long exposure images using ND filters, these filters, or sometimes even lenses are usually blamed for this problem (yes, some lenses can potentially create light leaks as well, but that’s rare and typically happens on very long exposures). 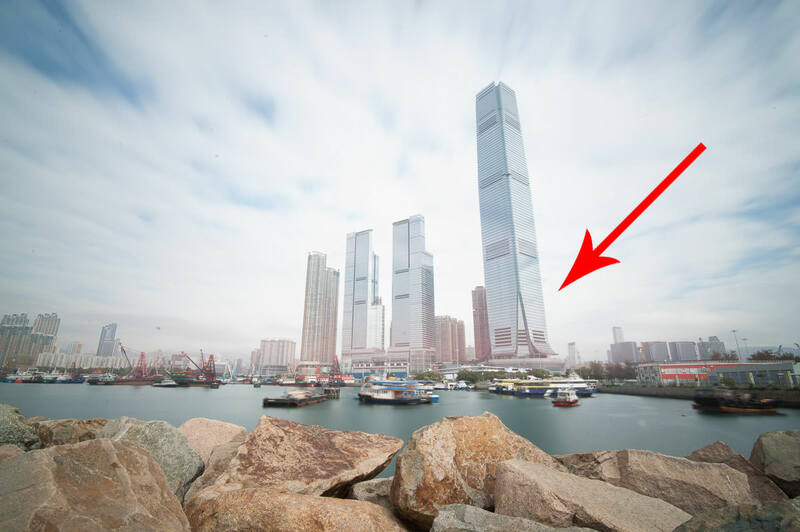 There is a lengthy and complicated process to fix light leakage using Photoshop or other photo editing tools, but the results may not be very convincing and it is often too much work to even bother trying to fix such leaks in post. If you have a lot of images to edit, it is far easier to shoot them all over again, than going through that nonsensical post-processing workflow. It is easier to prevent them from happening in the first place, rather than try to overcome them afterwards. The prevention is rather simple. Either compose your shot through the viewfinder, then cover it before starting the exposure, or cover the viewfinder up first and use Live View on the LCD of your camera to compose your shots (I prefer the latter method to avoid going back and forth). To cover the viewfinder you can use a piece of black Gaffer tape. It stops light from spilling into the camera. Remember how photographers back in the day used to cover the camera and themselves with black cloth to prevent light from leaking into the camera? The idea is the same. For those of you who have cameras with a built-in viewfinder shutter or a cap, it is a much easier process. If you are a Nikon user, most of the pro bodies would have that viewfinder shutter. For cheaper entry level DSLRs, however, the only good solution is to use Gaffer tape to seal off the viewfinder. Kevin, the Nikon DK-5 eyepiece cap fits about anything down to the D3300, and it’s supplied with many of the non-pro DSLRs. There’s no need for tape! I disagree. They’re too easy to lose and a PITA to install. You have to remove the rubber cap and slip on the DK-5, then reverse the process when you’re done. Not difficult but still a pain. I agree with Patrick here. The DK-5 is just another piece of fluff that Nikon has to sell. Might be useful for very long astrophotography but not for general use. Tape is easier and faster. Excellent article Kevin and I got caught on this issue many years ago. 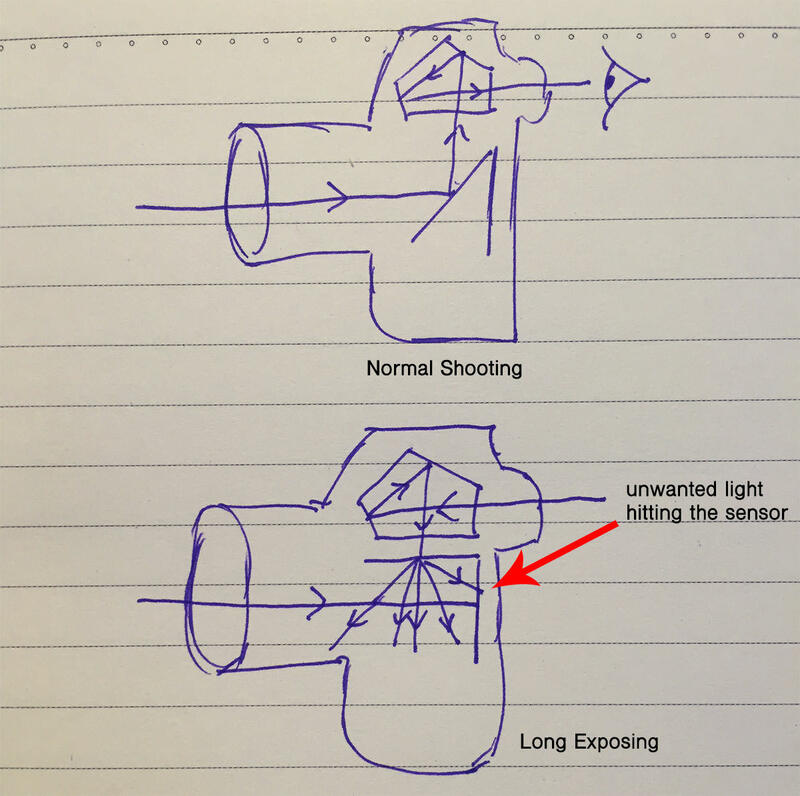 However, although covering the viewfinder eliminated around 95% of leakage on extra long exposures, leakage still occurred. This was down to the distance scale fitted on some lenses and covering the plastic viewing cover finally eliminated the remaining leakage. I am talking here of very long 4 minute + exposures. I seldom take more than 4min+ exposure Richard. When the exposure time is so long, there will be too many hot pixels which require lots of post process time. But you get the point right. Sometimes light leak in between connection between lens and camera body, or some where else. Yes – Canon cameras too have a small rubber ‘cap’ attached to the strap, to close off the viewfinder (and have had for many years). I presume this doesn’t happen in mirrorless cameras? Correct, not through the viewfinder. There are possibly other avenues of leaks like side ports and such that might not be sealed perfectly. A lot of cameras and lenses have some degree of light leaks and they aren’t relevant for the vast majority of uses. But night shots and long exposures are a good way to find them. Cheers – and I suppose it’s less likely to happen in a camera / lens that is weather sealed? The reasoning is not unsound, and I could be wrong, but I’d wager that it isn’t relevant at all for light-leaks. Yup. I agree. To solve this leakage problem, simply cover the whole camera with a black cloth like the old days. My D810 has a switch beside of the eye cup to close a leaf shutter on the viewfinder. Just get a D810. Problem solved. my D700 also have the eye cup. Remember; the Nikon engineers who gave us the D3/D300 and D700 most likely retired. Marketing now runs Nikon. While this can happen at night, it is more likely when using strong neutral density filters during the day. Then even a small leak of strong light through the viewfinder can interfere with faint light coming through the intended way. yes you get the point. Also, when stacking two slot in filter may give you light leakage too. “If you are a Nikon user, most of the pro bodies would have that viewfinder shutter.”… The sole reason I didn’t get a D750 ! Of all the minor differences between the D750 and D800/810 this is really the only one that I wish my D750 had. I’ve seen a few suggestions online on how to change the viewfinder cap on the non-pro bodies to a circle-shaped cap–but the circle shaped cap they’re using doesn’t have the viewfinder shutter which is the thing I really want. If Nikon, or a third party, would develop a viewfinder cap for my D750 with a shutter I’d buy it in a heartbeat! Jason, not a problem. I usually wear a hat and use that. I’ve even used my thumb very carefully. Not really an issue. OH and a small piece of gaffers tape works also. Really, there is no such thing as a “pro body”. Just bells and whistles on a piece of equipment. The “pro” is the person behind the camera making the tool work for him/her/themselves. I would think a body, preferred by most pros, would qualify as a pro body. Some of the features on such cameras would probably appear to be bells and whistles for those individuals who don’t need or use them, be they pros or not. Sturdier construction, of course, would also be preferred by professionals who use their cameras more often and for longer periods than the average user. I understand your point but it’s misplaced here. Patrick, I always enjoy our exchanges; and I don’t disagree with your statement. I don’t think the point is misplaced and here is why I say that. Recently, two pro friends of mine, very prominent in fashion photography, have switched from the D800-D810’s to the D750. They both felt that this camera worked better for their work than the pro models I’ve mentioned. Plus, just recently, Nikon Magazine had an article written by Vincent Versace who states that he too has switched from the D4s-D810 combo to the D750. I agree with construction issues but that really depends upon how the equipment is used or misused by the owner. Knowing that the D750 is not weather sealed like the D4 or D8xx I always carry a full rain coat just in case. (Think Tank Hydrophobia). Since obtaining my D750’s I have not taken the D800e’s out of the studio for much shooting. Patrick, what I was really getting at with that comment of mine was, any equipment in the hands of a professional photographer becomes a pro body for assignments delivered to a client. Clients never question the equipment used by the hired hand. They only want the finished product. Bells and whistles are nice and I think Nikon could have included a few I would have liked to see with the D750; but it is what it is. So what am I missing here? Mirror flips up and closes the path from the viewfinder. I’ve taken up to 2-4 minute exposures with my D600 & D5100 bodies and have never experienced this. The mirror on AF SLRs is not fully silvered in order to allow light to pass through to the AF sub-mirror and sensor. I assume this is the source of the problem that some people experience. The only problem I’ve had is light entering the finder interfering with the exposure meter. which doesn’t matter in manual exposure mode, but can mess up the exposure on auto modes when using a tripod and remote release. An eyepiece shutter is handy for stopping this problem, when I actually remember to use it! I suppose I may have been under dark enough conditions where the light was insufficient, for I’ve yet to see any fogging. Try using a flattened out blob of Blu-Tak over the eye piece, much cleaner and more reusable than tape. Wallace, not familiar with this product. What is it and where does one get it? What is it actually used for? On the front of the d800 there is a small white blob near the flash bracket button. This appears to leak light. Try this. with lens cap on and read blind shut on view finder. take a long exposure and shine a torch at the white blob. Then check your exposure. Do you cover the lens too? Sometimes light leak happen on the lens. Yes, I cover everything. The only part of the whole body/lens setup exposed to the outside world is the front surface of the nd filter. Even the edges of the filter holder is covered. I cant see anywhere that stray light could possibly be getting in. The spot is quite large, in a landscape shot using the 10-20 zoom at 10mm its about twice the size of what the full moon would look like. Any ideas.? Did you try covering the ports (where you plug your remote release cable)? Really Awesome Blog for photography tips and ideas !! For best Nature and Portrait Photography thanks for sharing all this beautiful blog list with us . The Nikon DK-5 works fine on their rectangular-eyepiece cameras. It’s a small part and is very easy to lose, especially if you’re often switching between bags/packs – which I am. I don’t keep neckstraps on my cameras because of what happens in the wind when on a tripod. I have found a good place to clip my current DK-5 – the wire to my remote release. If I’m using one, I’ll probably need the other.